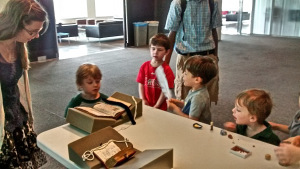 We hosted 20 four-year olds from Penn’s Children Center to come and see some manuscripts, and it went really well! “It’s sad that the people who made the books aren’t alive anymore, but it’s neat that their books are still here.” Among the conversation points that come up when a class of four-year-olds visits the library: mortality and the lasting nature of text. This came up when one of our recent young visitors asked about how the rare books in Kislak ended up there. The Penn Children’s Center had reached out to us about visiting to learn about what librarians do, and at the end of May, a class of four-year-olds came over for a tour. Great! I am an Italian teacher in the primary school, but I am also an archivist and I really appreciate the way you work with children (and old manuscripts/books). Thank you so much! I can’t express how much fun we have with these little kids, it’s very exciting to introduce them to manuscripts for the first time. We’re looking forward to more visits this year!